Note, this review was done in 2007 and the Doral Tesoro is now a Marriott and the course is managed by Troon and has been renamed The Golf Club at Champions Circle. We hope to update this review in the near future. Check our their website to learn more and here is the link to the Marriott's Stay & Play options. In April 2007, we checked into the Doral Tesoro in Fort Worth to experience their Stay & Play package - what a great deal! 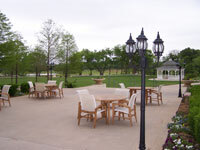 The Doral Tesoro is in Northeast Fort Worth a few blocks south of Texas Motor Speedway. The Doral has 286 contemporary guest rooms including hospitality, executive, and presidential suites. The rooms seem much larger and more comfortable than your typical hotel room and include all the modern conveniences that you would expect. In addition, most rooms offer expansive views of the surrounding area and the golf course. The Doral Tesoro is conveniently located to downtown Ft Worth and is only 20 minutes from DFW Airport. The Doral is close to shopping and the infamous Ft Worth Stockyards and Sundance Square for some of the best nightlife and restaurants. With over 22,000 square feet of versatile state-of-the-art meeting space, they are ideal for conferences, corporate retreats for planning or team building, or family reunions. Best of all, Doral Tesoro has a beautiful, fun, and challenging 18 hole championship golf course and a good Stay & Play package. The golf course was in excellent condition when we played in April 2007 and offered variety and plenty of challenges to test your golfing skills. Doral Tesoro Golf Club is a Texas Outside Favorite and earned 8.5 stars out of ten. To learn more about this magnificent course, read the Texas Outside review of Doral Tesoro. In April 2007 the cost for the Stay & Play package was $329 and included diner and breakfast for two, a round of golf, and a 25% discount in the Pro Shop. So what are you waiting for, pack the bags, load up the clubs, grab you best friends, spouse or significant other, and head out for some fun and an excellent round of golf.